Land O Lakes Family Home with Water and Preserve Views! 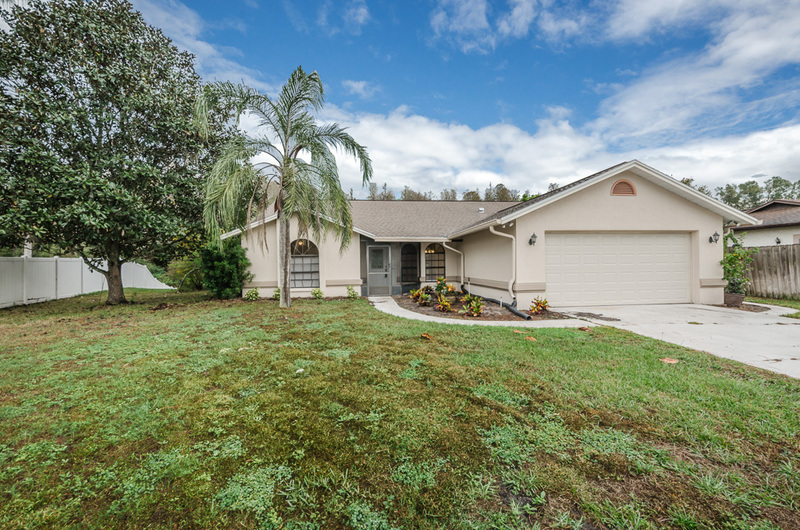 Beautiful Land O Lakes is the place you’ll find this lovely 3 Bedroom, 2 Bathroom, 2 Car Garage home built on a lot size of approximately .25 acres. 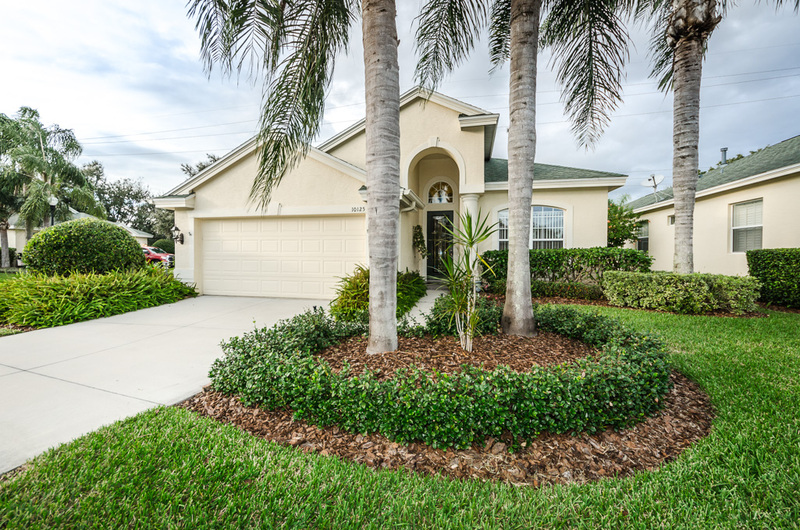 With water frontage and views of a lush Florida preserve, the setting is simply ideal to enjoy as your permanent residence or a seasonal getaway! The outdoor space is a little piece of paradise. An expansive lanai features panoramic vistas to enjoy from the luxurious, built-in hot tub. Inside, the tiled foyer introduces the soaring vaulted ceilings that crown the Great Room and adjacent dining room. Triple sliders and large windows welcome in the sunshine that casts a warm glow on the stunning decorative concrete flooring. Nestled in the center of the home is the showroom quality kitchen. Besides the luminous new cabinetry and granite counters, new appliances shine to complete the elegant design that includes ornamental niches, pendant lighting, and a charming, windowed breakfast nook. The airy master bedroom suite also boasts vaulted ceilings. Sliders from both bedrooms lead to the lanai’s tranquil ambiance and showcase its surrounding scenery. Additional updates include a newer garage door, newer Trane A/C system, and new granite counters in both baths. With monthly fees of only $36, you’ll enjoy the long list of community features which includes: clubhouse, restaurant, and heated pool; tennis, basketball, and racquetball courts; a running track, and playground with picnic area. Simply exquisite and immaculate, this home is the definition of move in ready. https://trinityeastlakerealestate.com/wp-content/uploads/2018/03/LC-WebLogo-340x156-300x138.png 0 0 loricrawford https://trinityeastlakerealestate.com/wp-content/uploads/2018/03/LC-WebLogo-340x156-300x138.png loricrawford2015-12-18 08:48:032015-12-18 08:48:46Land O Lakes Family Home with Water and Preserve Views! Framed in lush greenery and set on a corner lot, this 2 bedroom/2 bath home features a separate office/den and an absolutely exquisite 19×23 ft screened lanai w/ jetted hot tub. The entryway’s graceful barrel portico is mirrored by the barrel ceiling of the welcoming foyer with its leaded glass door and gleaming floor tile. Triple trey ceilings add a dramatic flourish to the Great Room highlighted by a sleek, wood-burning fireplace and sliders to the peaceful outdoor retreat. A sunny kitchen is lit by the trio of windows surrounding the spacious breakfast nook and boasts rich, solid wood cabinets, decorative glass insets, gas range, and lustrous counter tops providing entrée to the large formal dining room. The contemporary open floor plan offers a split bedroom layout; the master suite is a private enclave with sliding doors to the lanai. Its bath is well-appointed with a dual sink, double vanity fashioned from solid wood, garden tub, separate shower room, and walk-in closet. Both the guestroom and the 2 car garage have added built-in storage; other pluses include: a laundry room, a power-surge system, a 50 gallon quick-recovery hot water tank, Soft-Water system, and newer concrete driveway. This stunning home is in the gated St. George section of the Villages at Fox Hollow. Reclaimed water is used for irrigation, while the HOA fees cover: lawn maintenance, tree trimming, mulch, & fertilizing. Nestled in thriving Trinity, an optional membership to the acclaimed Fox Hollow Golf Club is available.